Rhi is from the Queensland Department of Transport and Main Roads. As one of many agencies that are part of the Queensland Government, TMR are going through a cultural renewal program which involves all 6500 employees. One of the ideas that Rhi turned into action was driving the adoption, launch and engagement of a Yammer network across the organisation. 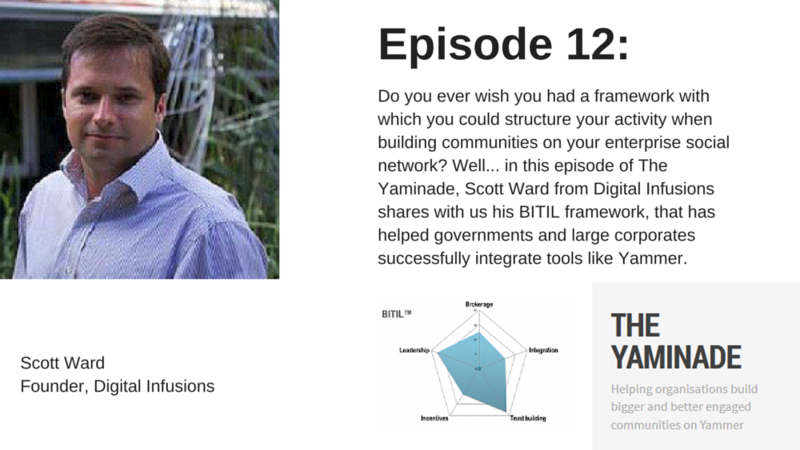 In this episode of The Yaminade, Rhi talks about the broader transition the organisation is going through, how she turned her idea to adopt Yammer into action, and some of the successes (and challenges) she and her Yammer Champions have seen over the past 6-12 months. Remember… the Yaminade is in it’s infancy – I haven’t got to the funky podcast opening and closing music yet so please enjoy The Yaminade in it’s rawest form! Paul: Welcome to The Yaminade, Rhiannan Howell from The Department of Transport and Main Roads in Queensland, Australia. Paul: Awkward start! We’re basically running our own responsive coffee between myself and Rhiannan. For those of you who don’t know what responsive coffee is, I’ll put a link into the show notes about it. I guess it’s a driving force within the Yammer community. If you want to meet other people who are facing similar challenges to you or looking to explore how to use Yammer or Enterprise social within their organisations, then get onto your local responsive coffee. So enough about that, Rhiannan let’s learn a little bit more about The Department of Transport and Main Roads (TMR) and what your organisation is trying to achieve. Rhiannan: Sure. Transport and Main Roads is based in Queensland, Brisbane, that’s our central Head Office. We’ve got about 6500 staff in about 80 work locations across the state: some really big offices, some really small offices and we manage about 60 customer service centres where people can go and renew their rego and licencing for cars. Paul: Basically like the Department of Motor Vehicles in the US but you’ve also got responsibility for main roads and highways in the state as well. You’ve kicked off this Yammer journey over the past twelve months. It’s aligned to us a really strong strategic initiative within the government. Talk to us a little bit more about that program and some of your goals and how they align with using Yammer at the moment. Rhiannan: The Queensland Government is moving towards being the most responsive public service in the nation. So to do that the government has acknowledged that there needs to be a significant shift from the old bureaucratic commander control into a more network-type arrangement. TMR is really embracing that by aligning Yammer as a way of putting ideas into action, so really being a big strategic driver of our innovation agenda, which is probably one of the leading agendas in Queensland Public Service. Paul: Before we get into Yammer, what are the things that are happening around the social network and what kind of activities are the organisation putting in place? From a leadership point of view, what’s the messaging coming from the workforce and then let’s dive into the Yammer thing itself. Rhiannan: I undertook a bit of a social experiment. I work in a small area called Strategy Renewal, we’re leading innovation and workforce renewal, so really looking at what our leaders need to equip them to lead our people into the future. 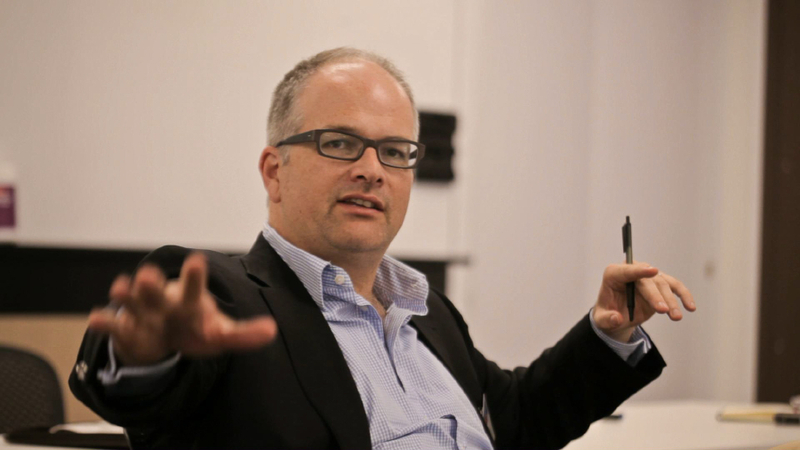 For us, it was about shaking up a very aged old, long-tenured service and disrupting what they’re trying to do. It’s about removing some controls and empowering people to try new things. For us, Yammer has been a key part of that process. Paul: So being a public service government agency, a lot of your workforce had been there for a very long time and are used to doing things in a certain way. I think you mentioned you have people in the workforce that have worked there for 40 years and on top of that, so they’ve spent their entire career within the one organisation, they’ve seen everything. As for the Yammer network, give us some stats first, because we all love stats, how many people do you have on the network? Rhiannan: We’ve got 3429 people when I last checked about 20 minutes ago. That’s about 54% of our workforce. I think we’ll get to 4000 and I don’t think we’ll get many more than that. Rhiannan: Just because of the type of work that some people do. Some of them don’t use computers. Some of them don’t have smart devices, particularly some of our workers in the older generation. We don’t push it, it’s not a compliance activity for us, it’s about giving people access to the tools and allowing them to opt-in to the process. Paul: Your launch event for your community on Yammer was this leadership roadshow where you have executives encouraging people to test it out, which is great.. Once you’ve got people in the network, what activities do you use to drive engagement, to make sure it’s sticking and going to be integrated into business processes? Rhiannan: It wasn’t about the number of people joining the network so we created a series of micro-challenges which align to our Public Service Values. We’re trying to embed through Grow Not Show strategy. Paul: A clear alignment to core values and aspired cultural values in the organisation. Rhiannan: That gave people something to do when they got there. We also encouraged people to create their own groups and we encourage them to make them cross-functional, so it wasn’t about “my branch is doing this or my location is doing that”, it was about connecting people from across the state. Rhiannan: And to relate groups to each other so they can be linked and people can then follow a theme and jump on board for other groups. We’ve gone out with the strategy of making everything public as much as you can. That would be my advice to anyone. 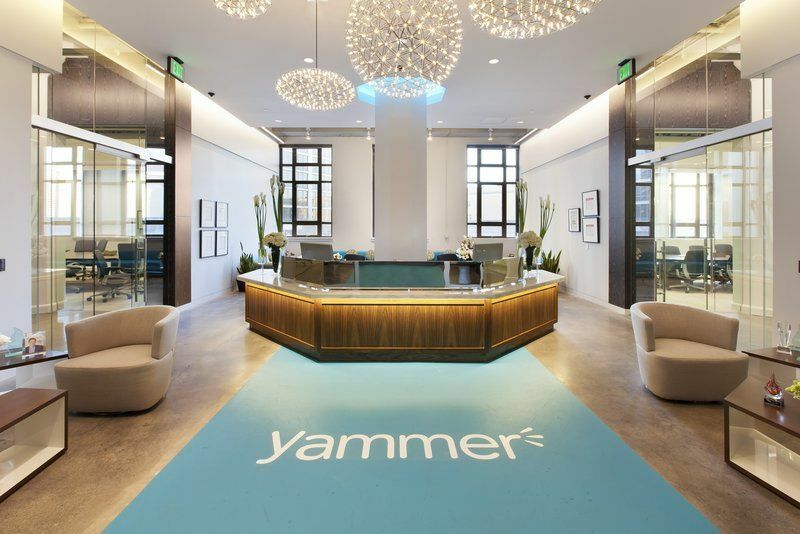 The whole intent of Yammer for us is about transparency and connecting people who can’t traditionally be connected, so I would encourage as many groups to be public as I can. Paul: Metrics are always good, how many networks do you think you’ve got in your group? Paul: Do you have any plans around governance? People see that and think “there’s 215 groups, how are you going to manage that?” or are you just going to let it be organic? Rhiannan: Definitely let it be organic. My community management role is 5-10% of my day job. The idea of us using Yammer to really disrupt the culture in TMR is about everything in TMR you need approval for or there’s a form you need to fill out and someone needs to sign something off, so Yammer is about totally disrupting that. Paul: Apart from yourself, 5-10% of your role, so let’s be generous and say that’s 8-10 hours a week, maybe on your lunch break, is there anyone else inside your organisation who is formally tasked with managing this? Or have you built an informal network of people to do the heavy lifting for you? Rhiannan: I’ve built an informal network and that’s from people who have an appetite and a real desire to embed Yammer as a business tool within their teams. Paul: How did you find those people? Did they just come out of the woodwork? Rhiannan: This spread all over state. The Customer Service Centre Manager in Mount Isa was my first Yammer Champion. Paul: To put that into context, Mount Isa is as far away as you can go where there’s civilisation in Brisbane! Rhiannan: It’s a mining town of about 10,000 people and it’s completely different to Brissie. Paul: It’s a different world! Out of those Change Champions who are just doing it because they want to, are there any behaviours of attributes that people could look for? So if they don’t have a network but are trying to set one up…. Rhiannan: and I haven’t had one say no so I’ve got about ten people in my network. Paul: Very good. So we’ve talked about the good things. Let’s talk about the harder things, the more challenging things, the pull-your-hair-out type things. For me, it’s middle managers. It’s this layer of an organisation where it’s really difficult to get traction. They have had their own control over the communication process for so long and now they’re losing this. Do you have any middle managers who are on board with this or is this a gap you see? Rhiannan: It’s definitely the gap I see in my network. On a handful of occasions I’ve had people tell me that they are going to leave the network because their Manager isn’t happy or he’s trying to censor what they’re trying to say on Yammer. We got a really good buy-in from the top and grassroots, but it’s the people in the middle we’re struggling in it. Paul: Have you seen any examples of success where one of those Middle Managers has got on board and wants to share the success with the team? Rhiannan: We’ve got a strategic policy area which will look after 30 year long-term vision strategies for The Transport Network. Their management group has really got on board about it being an opportunity for them to have a voice in the organisation. They’re hosting the Yam Jam next Friday. It’ll be the first non-strategy and renewal type Yam Jam that’s happening in the business and it’s around the Queensland Plan. Paul: The context of the Queensland Plan is basically a vision for the next twenty to thirty years for the state of Queensland and how government agencies like the Department for Transport and Main Roads respond do this. Paul: I’ve been watching all the adverts so I’m an informed constituent. Another thing is that none of your offices have Wi-Fi? Rhiannan: I think one office has Wi-Fi! Paul: So when I say a lot, all of them! That’s an interesting thing to think about. If you’re using Yammer and encouraging people to use it on their devices, but if you want that kind of engagement within the office, you can’t have those opportunities where you can engage and go down to the shop or another office, it’s hard to get that connection between the individual and the end point. Rhiannan: I have no doubt that if we had Wi-Fi we’d see engagement increasing. I think it’s on the long-term roadmap. Right now we’ve got a lot of facilities that we’re moving out of, so it makes sense for them to consolidate the accommodation strategy before we go down that path. Paul: Exactly. 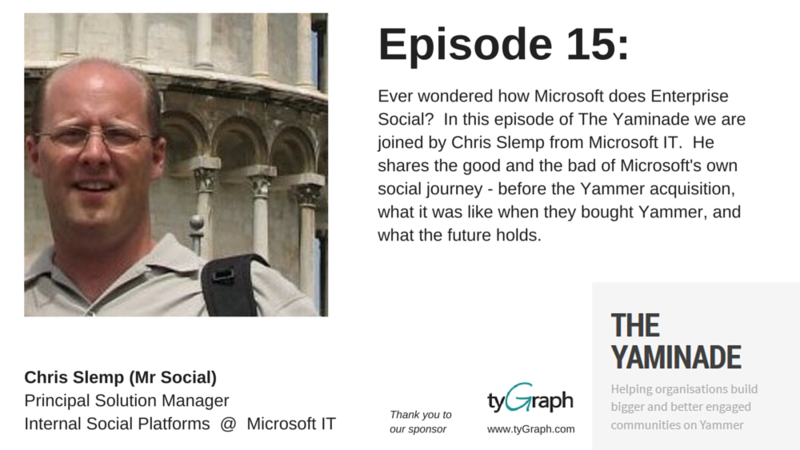 I love hearing the success stories of people using Yammer, and how Yammer has changed their organisation. Do you have a Yam Win that you’ve seen in the last six to twelve months that absolutely summarises why TMR is doing that, that lighthouse story? Paul: That’s sensational! How long would that take to get that kind of engagement from your workforce in the past? Rhiannan: If that! Have those ideas turned into action? It’s really easy to collect information but have we seen that translated into real business outcomes? Rhiannan: Absolutely. On that example, the innovation strategy sourced our ideas, went back to the community that provided the input and rescoped some part of that strategy so that was a key bit for us and now the team in my area that focuses on innovation is looking at the strategy, so they’re building innovation capability frameworks, they’re looking at R&D spend and how we can better utilise that, so they have a pipeline that they’re working their way through. Paul: Brilliant. What’s the most surprising thing that’s happened that you thought would never happen?? Rhiannan: A couple of weeks ago our corporate area ran a Leadership and Diversity event in the cube, which is a fantastic facility. Paul: I’ll put a link down in the show notes. It’s down at the Queensland Technology, the perfect place to put ideas out there and start thinking about stuff. Rhiannan: We had a panel event where we invited some key speakers to talk about not just women in leadership but diversity in general. Following on from that, it was the first time we streamed something to our officers so it wasn’t a Brisbane-central issue. We followed up with a post on Yammer by TMR and we’ve had 80 posts about recognising women in leadership, really good examples of leadership and that’s just conversations that haven’t happened before. Paul: It’s purely because you had an event which is realistically localised by geography. If you’re within 100km of Brisbane, you could get to it and you’ve never had that opportunity to share it with people before. Brilliant. I love stories like that which allow people to be discovered and working out loud on a network like Yammer. The content and connections are there and you’re not hiding it from anyone. If people want to jump on it they can. A nice way to wrap this up is that a lot of people are in your shoes, but they’re right at the start of the journey. What things would you have done to make things easier? What would you have done differently, potentially, that would bring you greater success? What do you wish you knew six to twelve months ago? Rhiannan: I guess what I talked about earlier was that Yammer for us was an ideas we put into action within 5 days. So we went from it being an idea in the back of my brain to being a network in five days. If I had my time again, I’d have an extra five days to think about how we’re engaging people and what we do when we get them there. With the micro-challenges, we incorporated them almost at the eleventh hour, so there’s some really due consideration around that. We’ve got heaps of great ideas but it’s about connecting into the pipeline so we can demonstrate that this isn’t somewhere you put your ideas into it and it goes into a black hole, it’s about driving efforts and we’re developing a process called Idea Jam, but we can talk about that another night. Paul: Idea Jam? Sounds like a whole other episode, that’s great! 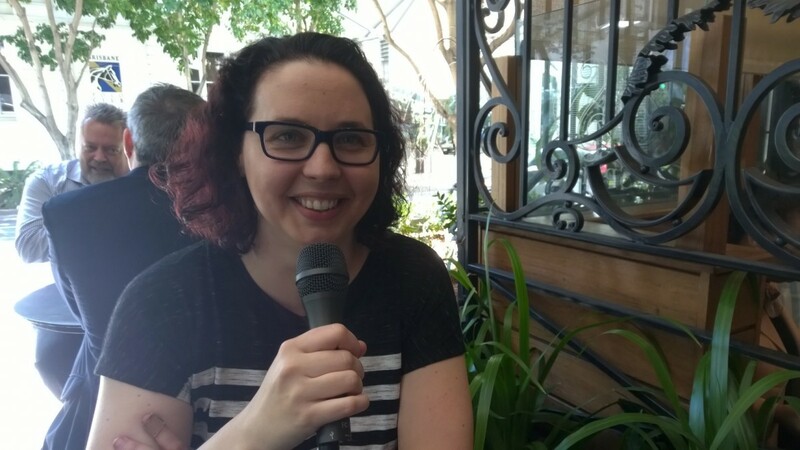 Rhiannan: Secondly, really establishing some kind of formal Yammer Champion network which I could incorporate – community management into people’s jobs. If I go on leave, which I haven’t since we’ve had Yammer, we would potentially have a problem. Paul: everything would fall apart. Rhiannan: So I’d formalise that so I would have more support. Paul: You’d put some process in place to ensure that whoever’s there, there is some formal process to keep things are on track. Rhiannan: It probably goes back to the start. I probably didn’t have a grasp on the functionality, so I was figuring out how to do praise from the start, and I think that having gone through certification like community management certification that’s offered through Yammer, that would have been good. Paul: Some awareness with what’s possible with the tools. Thank you so much for sharing your story with us and the rest of the Yaminade community. I think that story is quite powerful: you have a large, diverse organisation with geographical spread, an ageing workforce and a Gen-Y workforce in the same time working together to get great outcomes and it’s really aligned to the cultural renewal that the organisation is going through and it’s an example of how enterprise-social tools can really drive business outcomes. Thank you, Rhiannan!